Alxa or Alashan (ā lā shàn 阿拉善) League is located at the west end of Inner Mongolia Autonomous Region. It is adjacent to Mongolia in the north, adjoins the Great Wall in the south, neighbors on the Yellow River in the east, and leans against the Hexi Corridor (hé xī zǒu láng 河西走廊) in the west. On this 270,000-square-kilometer (104,247 square miles) land lives 28 ethnic groups including Han, Mongolian and Hui (huí 回) people. 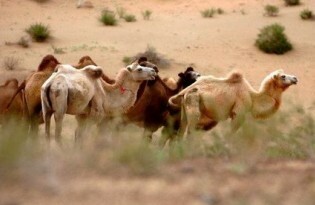 Reputed as the 'hometown of camel', Alxa is abundant in two-humped camel and the white down producing goat. The mysterious land is also a tourist paradise, attracting visitors by its brilliant ethnic culture, unique desert landscape and plentiful historical relics. Lying in the hinterland of the Asia, being encircled by mountains and far away from the sea contributes to the typical continental climate of Alxa. Generally, it is short of rain while the wind is strong and sandy, thus the weather is always dry. The rainy season is usually in July, August and September. The annual amount of precipitation is 200 millimeter (7.87 inches) in the southeastern part and 40 millimeter (1.57 inches) in the northwestern part. The difference in temperature between day and night is large. The annual average temperature is 6 to 8.5 degrees Centigrade (42.8 to 47.3 degrees Fahrenheit); the lowest temperature -36.4 degrees Centigrade (-33.5 degrees Fahrenheit) is in January while the highest temperature 41.7 degrees Centigrade (107 degrees Fahrenheit) is in winter. Alxa region is one of the birthplaces of human beings. Tens of thousands of years ago, during the Paleolithic Age, human beings appeared in this area. The Mandela Mountain Rock Paintings that was carved 6,000 years ago vividly depicted the ancestors' daily life. 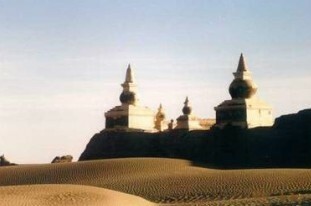 Having a profound history, Alxa has many historical sites and precious cultural relics, such as the ancient Badan Jaran Desert (bā dān jí lín shā mò 巴丹吉林沙漠) and Helan Mountain (hè lán shān 贺兰山) where emperors of the Qing Dynasty (1644-1911) (qīng cháo 清朝) left their inscriptions. The three deserts of Badan Jaran, Tengger (téng gé lǐ 腾格里) and Wulanbuhe (wū lán bù hé 乌兰布和) which cross the whole league are generally called Alxa Desert with a total area of 84,000 square kilometers and is the second largest in the country and fourth largest deserts in the world. Alxa has distinct tourist features. The first is the uniqueness of the natural scenery. 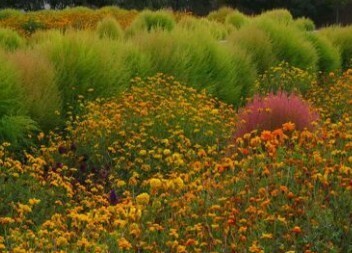 The various patterns of natural ecology such as mountainous areas, forests, grasslands, deserts, Gobi, pools, salt lakes, and psammophyte, etc. 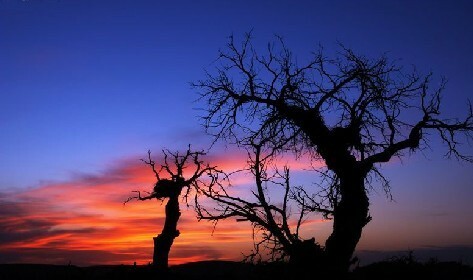 which have formed the different scenic systems such as mountains and rivers, large deserts, Gobi and grasslands, etc. The second is the non-replacement of the humanistic resources. The Alxa Mandala Mountain (màn dá lā shān 曼达拉山) Rock Sculptures which is called “the Primitive Society Gallery”, the Juyan (jū yán 居延) Relic which is well-known for a long time, the Tibetan Buddhism and Eight Temples, Dongfeng Aviation City (dōng fēng háng tiān chéng 东风航天城) which was the initiating spot for “Shenzhou VI” (shén zhōu 神舟) Spaceship , the Minority flavor of Mogolia in Weilate (wèi lā tè 卫拉特) and Tuerhute (tǔ ěr hù tè 土尔扈特) of Alxa, etc are all resources only possessed by Alxa. The third lies in the originality and mystery of the area. The highest sand mountain of the world, the largest loud sand area and the most serried area with sand lake groups all gather in Badan Jaran. The poplar of Eerna can “live for a thousand years without falling down, alive for another thousand years after falling down and enduring for another thousand years after death.” The miraculous stones in desert and Gobi are so vivid with different poses and expressions. Tuerhute, who returned to motherland through thousands of hardships and dangers, has settled right in Alxa. “Jiuquan (jiǔ quán 酒泉) Satellite Launching Center” was originally set in Alxa. Helan Mountain is the largest north-to-south mountain range in northwestern China. 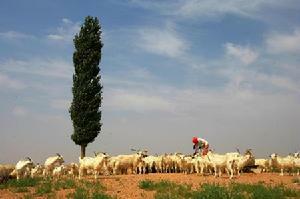 It neighbors the Loess Plateau in northwest and the Qinghai-Tibet Plateau in northeast. The unique location blesses it with distinct natural scenery, human landscapes and ecosystems. Lying in Alxa Left Banner (ā lā shàn zuǒ qí 阿拉善左旗) in Inner Mongolia, Helan Mountain National Reserve covers a large area, 261 square miles, with the highest peak measuring 11,700 feet. 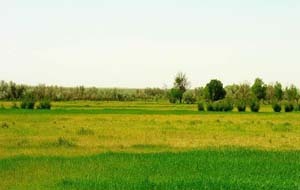 It lies in the transitional zone between grassland and desert. The main feature it protects is the forest ecosystem in arid and semiarid regions which contains rare plants and animals. Walk into the virgin forest of Helan Mountain, and you will feel you are entering a natural "zoo" which is home to hundreds of wild animals such as musk deer, berghaan, foxes and dzeren. Standing on top of the mountain and having a vertical view, you will be dazzled by the vast green sea of trees and, at the same time, be astonished by this marvelous creation of nature. 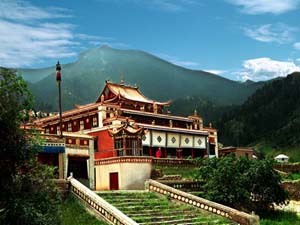 Guangzong Temple is located at the west foot of Helan Mountain Mountain. It is locally called "South Temple” (nán sì 南寺) due to its south location of Bayanhot (bā yàn hào tè 巴彦浩特). In Tibetan language, it is called "Gedandanjilin” (gé dān dàn jí lín 噶丹旦吉林) with the Chinese meaning as "Absolute leadership of Guangzong Island”. Located in the southern foot of Helan Mountain, 90 kilometers from Yinchuan and 30 kilometers from Bayanhot, the district integrates Tibetan Buddhism culture with natural sceneries of Helan Mountain. Helan Mountain is in the middle southern periphery of the Mongolian plateau, the biggest one going from the south to north across the northwestern part of China. With 520,000 mu of natural secondary forest, the district is a State grade natural protection area, national forest park and an important ecological barrier in the north-western part of China. With a total area of 50 square kilometers, Helan Guangzong Temple was built in 1756 to 1760 and named by the Qianlong Emperor in the Qing dynasty, the Guangzong Temple, which is famous among Mongolian and Tibetan religious circles for the mortal body tope of the sixth Dalai Lama enshrined and worshiped therein. With complete set of basic facilities and service functions, the tourist district possesses natural and calm environment which makes people completely relaxed and reluctant to part with. Location: 30 kilometers away from Bayanhot. How to Get there: There are tourist lines from downtown to Helan Mountain South Temple Resort. 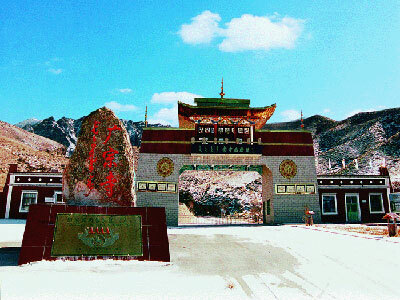 Located in the Helan Mountain State Forest Park, 25 kilometers north of Bayanhot and 160 kilometers from Wuhai airport, the district is the second largest Tibetan Buddhism shrine in Alxa League, which was built in 1804 and named by the Jiaqing Emperor (嘉庆帝) in the Qing dynasty the Fuyin Temple. The tourist district features multiple surrounding hills, evergreen pines and cypresses, singing birds, fragrant flowers, beautiful scenery, convenient communication and transportation system. With complete set of hotel and restaurant facilities, the place is an ideal summer resort, holiday and tourism scenic spot. The most prestigious cultural celebrity in history of the North Temple is Awangdandeer, who is not only the pride of the North Temple, but the great son to be proud of in Alxa League. He is the cultural giant in Alxa history and is a generation of great scholar who made great achievement and contribution to Mongolia and Tibetan ethnic culture. Location: 25 kilometers north of Bayanhot and 160 kilometers from Wuhai airport. How to Get there: There are special buses going directly from Bayanhot to the place. Tips: tourists here can enjoy the sea of woods, climb stiff mountains, travel ancient temples, play with colorful balls, enjoy sunrise of woods sea in the morning and appreciate the sole column of smoke in desert at dusk. Located in the center of Tengger desert of Alxa League, 130 kilometers from Yinchuan Airport and Railway station, the Moon Lake features three points: firstly, the lake resembles the map of China very much; secondly, it makes up a prescription for natural medical bath with water rich in multiple trace elements beneficial for medical bath; thirdly, the black sand beach is good for natural mud therapy, physical beauty and health. The scenery district is divided into five parts: namely folk custom district, leisure district for meetings and institutions, hotel villa district, exemplary ecological garden district, and outdoors experiencing district with main tourist items including desert surfing, horse-riding, camel-riding, swimming, sand skating, beach volleyball, beach football and so forth. 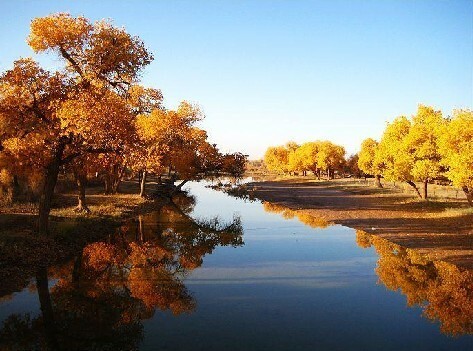 With complete set of water supply, power supply, communication facilities and convenient transport system, the district is the most special and attractive spot for desert holiday exploration tours in the western part of the Inner Mongolia. How to Get there: There is a tourist special highway 48 kilometers long 18kilometers from Yinba Highway southward. From here, then cross Tengger desert, you can directly reach Moon Lake Scenic Area reception station. After that, change to “Shunliu Bus” (a kind of desert buses modified by military trucks) or off-road vehicles to traverse the great desert and arrive directly at Moon Lake. Located in the southern periphery of the Tengger desert, 195 kilometers from Bayanhot and 18 kilometers from Shapotou Tourist District (shā pō tóu lǚ yóu qū 沙坡头旅游区) of Zhongwei City (zhōng wèi shì 中卫市) in the Ningxia Hui Autonomous Region (níng xià huí zú zì zhì qū 宁夏回族自治区), the district is an exemplary spot for agriculture tourism and has four square kilometers of wet land, featuring green grass cushions, clean air and natural sceneries with main tourist items including karting, watching migratory birds, fishing, camel-riding for desert exploration, sand skating and many others. Location: In the southern periphery of the Tengger desert, 195 kilometers from Bayanhot. 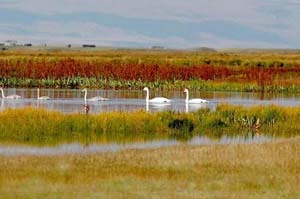 How to Get there: There are tourist lines from downtown to Tong Lake Marsh Grassland Tourist Area. Located in the western suburb of Bayanhot, the central city of Alxa League is the main venue for holding festival activities such as Alxa Prairie Cultural festival, Nadam festival and many others. 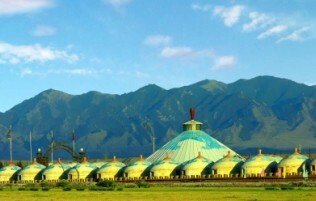 As a car camping site in Alxa, this special tourist district integrates restaurant and hotel with ecological tourism, desert exploration, leisure holidays, sports competition and meeting undertaking with main scenery spots such as the biggest yurt village in China, standard motorcycle athletic field, Wurisi obo, and desert plant garden. Tourist projects include special diet, equestrianism, camel race performance, bonfire party, sacrifice obo, desert exploration, beach recreations, big scale Mongolian artist performances, hang gliding sightseeing and many others. Location: In the western suburb of Bayanhot. Located in Ejina Banner (é jì nà qí 额济纳旗) of Alxa League, 640 kilometers from Bayanhot, the natural diversiform-leaved poplar forest covering an area of 450,000 mu is one of the only three of its kind existing in the world today and is designated as a State grade natural protection district and forest park. It is believed that poplar trees can live up to a thousand years, would never fall down for a thousand years after death and never get rotten for a thousand years after falling down. 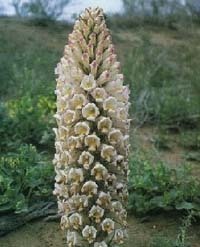 Therefore the species is praised as living plant-fossil and designated as the second grade plant for protection. The district is also a main venue for Ejina Banner to hold festival activities and large scale meetings. 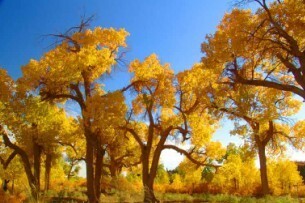 It is a poplar ecology and culture demonstration base and ideal location for photo amateurs. Location: In Ejina Banner of Alxa League, 640 kilometers from Bayanhot. How to Get there: Travelers can hire vehicles there. 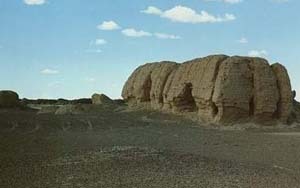 Located in an area covering 60 square kilometers at downstream of Ejina River (é jì nà hé 额济纳河) in Alxa League, the Juyan ruins are important large scale relics of the Inner Mongolia Autonomous Region, the contents of which are involved with politics, economy, military affairs, religion, languages, literature, east-west cultural exchanges, ecological environment changes and many other scientific fields. All the relics are precious for textual researches. The relics are mainly unearthed from Heicheng, Hongcheng (红城), Lvcheng (lǚ chéng 绿城), Datongcheng (dà tóng chéng 大同城), and Jiaqusai (jiǎ qú sài 甲渠塞), among which Heicheng represents an ancient city ruins left over from Xixia (xī xià 西夏) State, an important constitutive part of the Juyan culture. Notes: The word of Juyan is Chinese translation of Huns, which means “heaven”. After the 19 year-old general of Han Dynasty, Huoqubing (huò qù bìng 霍去病), successfully defeated the Huns, Han Dynasty had ever stationed here to guide the boundary. Thus, a brilliant civilization of Han was created in Juyan area. Located in Ejina Banner of Alxa League as an important constitutive part of the Juyan culture covering a total area of 180,000 square meters, the district is the most complete and still existing ancient city ruins left over from Xixia State (1038-1227). It was then an important agriculture and livestock husbandry base and frontier stronghold of Xixia as well as an important relay station in the Hexi Corridor in the Yuan dynasty (yuán cháo 元朝). With large amount of unearthed cultural relics, it is a famous scenic tourism spot. Location: In Ejina Banner of Alxa League. How to Get there: There are tourist lines from downtown to Heicheng Relic. Located in Alxa League with a total area of 47,000 square kilometers and an elevation between 1200 and 1700 meters above the sea level, sand hills with a relative height of 500 meters are worthy to be called the Desert Mount Everest. The district features five superb views: strange form peak, whistling sand, lake, wonderful springs and temples. 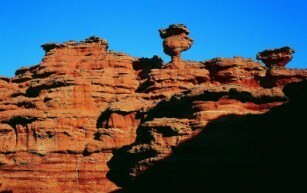 Located in Aulunbulage town of Alxa Left Banner, 300 kilometers from Bayanhot, the canyon is made up of Danxia (dān xiá 丹霞) conglomerate extending for five kilometers. After more than ten thousand years of erosion caused by wind, rain and flood, the canyon presents a magnificent sight where you can watch winding peaks and paths and enjoy totally different landscape every step you make that you would feel as if you were in a dreamy world. The district has more than ten natural scenic spots such as the Colorful Fairy Mountain, Sacred Root Peak (a rock stick resemblance to male's reproductive organ), Goddess Hole (a rock cave resemblance to female's reproductive organ), Red Pagoda Temple, beacon tower and so forth. Location: In Aulunbulage town of Alxa Left Banner, 300 kilometers from Bayanhot. 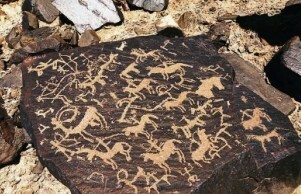 Located in Alxa League with an area of about 18 square kilometers, the still existing 4600 and more rock paintings can date back more than ten thousand years, contents of which include hunting, herding, the sun, the moon, stars, temples, dancing competition and amusement, vividly recording people’s production, life, cultural formation, natural environment, social style and features of the district in the remote antiquity worthy to be called the ancient art gallery in the North-western region of China. Location: On the Mandela Mountain in Alxa Right Banner. How to Get there: You can get there by taking a taxi from Menggenbulasumu (mèng gēn bù lā gé sū mù 孟根布拉格苏木). 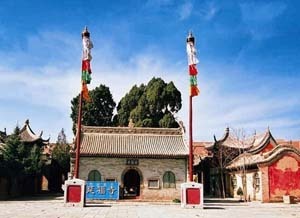 Yanfu Temple was originally one of the eighth temples of Alxa County. It is one of the ancient architectures of key protection in Inner Mongolia Autonomous Region. The temple started to build the Chief Palace from 7th year of Qianlong, Qing Dynasty (1742) and completed the surrounding buildings successively. In 25th year of Qianlong (1760), the Qing emperor granted the name to it as well as the tablets with golden characters written in Man, Tibetan, Mongolia and Han languages. There are over 10 palaces, large and small, in the whole building group of the temple. The temple, just like other temples of Yellow Doctrines, has set up the Holy College and was divided into four departments, each of which owns a specialized palace. Up till today, the temple has still kept a bronze censer cast in 33rd year of Qianlong (1768) with a height of 2.2meters and a diameter of 0.85 meters; a huge bell cast in 55th year of Qianlong (1790) with a resonant voice. Whenever it is beaten, the whole Bayanhaote town is surrounded by long lingering sound. How to Get there: There are special bus lines from downtown to Yanfu Temple scenic area or you can also get there by buses. Alxa has abundant ice and snow resources with a 5 months snow coverage period. 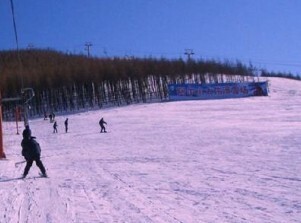 Surrounded by tree-clad mountains, Alxa Skiing Resort is one of the best ski resorts in China after the Yabuli (yà bù lì 亚布力) and one of the training bases for the Chinese Olympic skiing team. The ski resort contains two parts: the West Hill Ski Terrain for ski racing and training and East Hill Terrain for fun. The West Hill Terrain is built in accordance with the standard of international ski racing, suitable for competition and training. This part covers around 5.5 square kilometers with a great many alpine and cross country trails. The East Hill Terrain has alpine drops, runs for middle-level skiers and beginners trails. It has something for every level of skier. Ski machines have been set up to help the novices to improve their skills and enjoy the excitement. Alxa Skiing Resort has advanced facilities. There is one middle-level alpine lift, 800 meters in length with an average drop of 22 degree with the biggest drop of 22 degrees and 3 primary lifts average 6 meters in drop, totaling 1000 meters in length. Opening Time: Nov. - Apr. Location: On the border of Inner Mongolia (Province) in China and Mongolia itself, 3-4 hours by bus/train from Ulanhot (wū lán hào tè 乌兰浩特). How to Get there: From Beijing by air to Ulanhot, 3-4 hours by bus/train to resort. (1) Local specialty: crystal jewelries, crystal eyeglasses, Helan ink stone, Mongolian silver bowls, fine spinning camel hair products which are made with exquisite and careful workmanship, not only cheap but of good quality as tourist souvenirs. 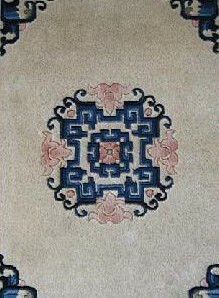 (2) Alxa League rugs modeled after antiques: Superb wool is selected for rugs made with exquisite workmanship which are plain, colorful, lofty, with rich local artistic style and enjoy worldwide reputation. (3) Desert cistanche: a famous and precious Chinese traditional herb, praised by people as desert ginseng which is of mild nature, used for invigorating the kidney, fortifying sexual organs and lubricating intestines. It is very effective for hypertension, arthritis and rheumatism. (4) Hoodoos: produced from Yinshan mountain (yīn shān 阴山) chain in the north of Alxa, Badain Jaran desert and Wulanbuhe desert. Being famous for its quality, forms, grains and rhyme, it integrates ancient style with strange, precious and scarce characteristics and is worthy to be praised as the best quality goods which as if had gathered essence of the world and congealed makings of the nation. (5) Sand paintings: a special artistic products in Alxa made with natural yellow sand to create colorful artistic paintings which would bring people fresh and esthetic feelings.